Make scripture memory a habit in your family & children’s ministry. Your children can start today and memorize the entire list before the year is complete. Acts 16:31 – Believe on the Lord Jesus Christ, and you will be saved. Psalm 145:9 -The LORD is good to all. Genesis 16:13 – You are the God who sees. Philippians 4:4 – Rejoice in the Lord always. I will say it again: Rejoice! Colossians 3:2 – Set your minds on things above, not on earthly things. Hebrews 13:8 – Jesus Christ is the same yesterday, today and forever. Psalm 150:6 – Let everything that has breath praise the Lord. Proverbs 3:5 – Trust in the Lord with all your heart. Romans 10:13 – Everyone who calls on the name of the Lord will be saved. Romans 3:23 – All people have sinned and come short of the glory of God. Matthew 5:14 – You are the light of the world. Psalm 145:9 – The Lord is good to all. Colossians 3:20 – Children, obey your parents in all things. James 1:17 – Every good gift and every perfect gift is from above. Matthew 28:20 – I am with you always. Ephesians 4:32 – Be kind to one another. 1 John 3:23 – Love one another. Psalm 56:3 – What time I am afraid, I will trust in You. Psalm 118:24 – This is the day the Lord has made; Let us rejoice and be glad in it. Psalm 119:105 – Your word is a lamp to my feet and a light for my path. Psalm 136:1 – Give thanks to the Lord, for he is good. His love endures forever. Luke 6:31 – Do to others as you would have them do to you. Philippians 4:13 – I can do everything through Him who gives me strength. Psalm 138:1 – I will praise thee with my whole heart. John 10:11 – I am the good shepherd. Ephesians 6:1 – Children, obey your parents in the Lord, for this is right. Proverbs 30:5 – Every word of God proves true. Matthew 6:24 – No one can serve two masters. Deuteronomy 6:5 – You shall love the LORD your God with all your heart and with all your soul and with all your might. Matthew 22:39 – You shall love your neighbor as yourself. 1 Corinthians 10:31 – Whatever you do, do everything for the glory of God. Psalm 19:1 – The heavens declare the glory of God. Genesis 1:1 – In the beginning, God created the heavens and the earth. Psalm 139:14 – I praise you God, for I am fearfully and wonderfully made. Isaiah 43:5 – Do not be afraid for I am with you. Psalm 1:6 – The LORD knows the way of the righteous, but the way of the wicked will perish. Matthew 28:6 – He is not here, he is risen! Acts 5:29 – We must obey God rather than men. 1 Thessalonians 5:17 – Pray without ceasing. 1 John 4:19 – We love because he first loved us. Psalm 46:10 – Be still, and know that I am God. Proverbs 2:6 – The Lord gives wisdom. Psalm 150:6 – Let everything that has breath praise the LORD! Ecclesiastes 12:13 – Fear God and keep his commandments. Isaiah 26:4 – Trust in the Lord forever, for the Lord God is an everlasting rock. Galatians 6:7 – Do not be deceived: God is not mocked, for whatever one sows, that will he also reap. John 11:35 – Jesus wept. 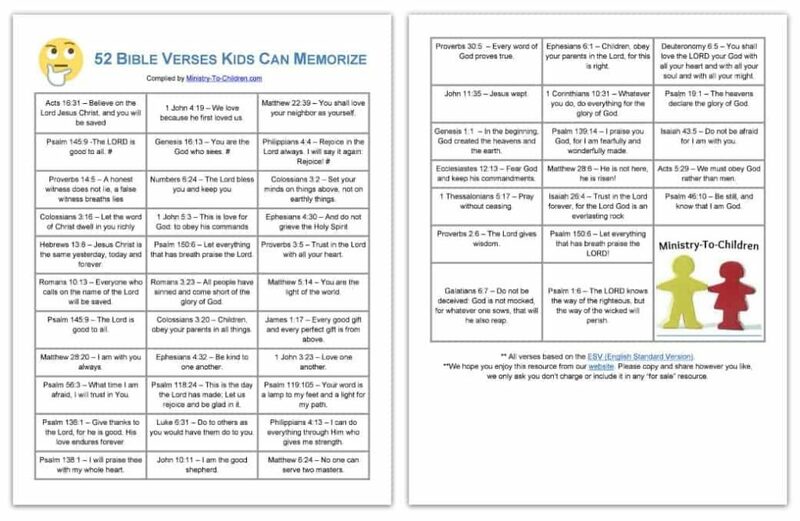 These child-friendly memory verses are based on the ESV translation. We’ve compiled the ultimate list of scripture verses about children and why children’s ministry is so important. This is perfect for encouraging church volunteers and keeping up your own motivation. Jesus loves kids – the Bible makes that clear in so many passages. But Jesus called the children to him and said, “Let the little children come to me, and do not hinder them, for the kingdom of God belongs to such as these. Children are a heritage from the LORD, offspring a reward from him. If you’re working with toddlers or preschoolers, you might want to start with the easiest bible verses for kids to memorize. They are included on this page, but some teachers like having just the simplest scriptures on hand. This printable will give you a scripture memory verse for every letter in the alphabet. This is especially fun with preschool and kindergarten children who are just learning their ABCs. God’s Word gives clear direction to both parents and their children. These list of verses explain the role and responsibility of mothers & fathers. They also explain the obligation of kids to respect & obey their parents. Children, obey your parents in the Lord, for this is right. (2) “Honor your father and mother” (this is the first commandment with a promise), (3) “that it may go well with you and that you may live long in the land.” (4) Fathers, do not provoke your children to anger, but bring them up in the discipline and instruction of the Lord. Hear, my son, your father’s instruction, and forsake not your mother’s teaching, (9) for they are a graceful garland for your head and pendants for your neck. Train up a child in the way he should go; even when he is old he will not depart from it. And you shall teach them diligently to your children and speak of them when you sit in your house and when you walk along the road, when you lie down and when you get up. Our list of scriptures to included on cards and crafts for Father’s Day. A collection of Bible verses you can add to mother’s day crafts or greeting cards. Remember that gratitude toward God is the foundation of the Thanksgiving season. These passages will are perfect to include on Sunday school crafts in November. The biblical story of Christmas should be front-and-center during the holdiay season. Use these verses for advent readings, children’s padgents, or greeting cards. Real love is best demonstrated in Jesus. These scriptures make plain the great commandment is to love God and the second to love your neighbor. See what great love the Father has lavished on us, that we should be called children of God! And that is what we are! It’s not about bunnies and chocolate. Resurrection Sunday is the focus of the whole Bible. These verses tell the story Jesus dying on the cross and raising again for our salvation. Do one verse per week – don’t let the entire list overwhelm your efforts. When it’s complete put add a smiley face sticker to that box. Print this list and post it on your refrigeration. Challenge the kids to work on them while doing chores or each time they go searching for a snack. It only takes 10 seconds to recite a verse. Add them to the calendar or family whiteboard. Consider a Bible memory game time once per week. Make it part of your scheduled family play time. Write the current verse on a card for their lunchbox. Each day leave off some words to make it more of a challenge. When kids learn biblical truth it gives them immediate opportunities to experience the power of God’s Word in daily life. Remember the scriptures weren’t made just to learning but for living. Children will gain confidence as they progress quickly through this list. Even toddlers and preschool age children will make fast progress. They will see how the Bible has answers for all of life, especially outside the church and Sunday School classroom. Once you finish this list, here are some other websites that compiled similar collections. Please leave us your suggestions to expand this list or share how you will use it in your church, home, or school. Matthew 4:19 Jesus said, follow me and I will make you fishers of men. First verse I thought my 3 and 4 year old and they learned it pretty fast. It will be a great add! I started printing out materials from this site in preparation for the children’s church this coming Saturday. This is a big help for us ! This is an answered prayer! Glory to God! May God bless you for the wonderful work. This site is a blessing. I work in a church based school in kwa njenga slums in Nairobi, Kenya and am finding the the site very helpful. Blessings. Thanks much. I like to make my own greeting cards, and include a scripture. There are lots of children (great-grands) coming along with birthdays. Your list is just what I needed. I am a sunday school teacher for my church in Ghana. I take care of children ages 7-12.
coming across this site has been very helpful to me in preparing my teaching material for my kids. You are a blessing to us. Thank you and may God continue to strengthen you. I’ve Learn a Lot in this Site. You are such a blessing to us, I am a new sunday School teacher of 3-9 old in DAS. Toledo City Cebu, Philippines.I keep on searching on how to help them learn more and more and then I found this Blog. Thank you so much. Its help me a Lot. God Bless and continue to bless the others.Have a Great day you all. teach pre – school through 7or 8. I love preparing for my students and seeing how excited they are to participate in class. I’m a retired educator, but I can’t stop teaching. I must do his will. i am a sunday school helper and we have quote-and-i-quote competition ahead of us….and i think with the help of God Almighty and ur site my ward will be the winner of the competition….THANKS 4 UR HELP. MAY GOD RICHLY BLESS YOU ALL.. I wanted incorporate bible verses with a wall decor I was making for my niece. This was a great help., Thanks. Thank you so much for laboring with this task. It will touch a multitude of children. It not only helps my grandchildren with memorization, but with their handwriting. You are a Blessing. Thank you so much! Its a blessing! I look forward to use it with my son this year. Psalm 23:1 “The Lord is my Shepherd, I shall not want”. First verse we taught our 2.8yrs old son. It’s a part of his daily prayer now. I teach a cooking class for an after-school inner city youth ministry. I wanted to provide the kids scripture cards they can take home each week. Thank you for your website! Thank you for your ministry to children and providing great resources. I am looking for short verses for my Sunday school children to memorize. I am going to have them say the verses antiphonally, one group says the first part, then the other group responds with the last part. am greatful with this verses, am a sunday school teacher i work with Kanduyi PAG Church Bungoma and i know God is going to bless you very much. be blessed. Psalm 119:11 Your word have I hid in my heart, that I might not sin against you. Tony Kummer (Editor) reviewed & updated this page on : April 15, 2019 at 6:03 am. All our content is peer reviewed by our readers, simply leave a comment on any post suggest an update.